Since writing the previous blog post about NxNYC, I was reminded of a story I forgot to tell in my blog post, either due to absent mindedness, tiredness, or some combination in between. Rather than updating last week’s post, I wanted to tell the story as a special thank you to our friends who visited SXSW while we held down NYC. The original NxNYC was based on three tenets, alcohol, friendship and cupcakes. The bar provided much alcohol both years, the friendship was provided by all our wonderful attendees, and the cupcakes were homemade by my co-conspirator Christina, with silly internet memes, hashtags and ephemera written on them. Alas, Christina’s schedule didn’t allow her to make this year, to the disappointment of those who enjoyed her baking last year. It was over an hour or two into our party this year when I walked over to Christina. The Loft at Prof Thom’s was quite active and everyone was having a good time. We were both quite happy with the turnout for the event so far then she told me about a text message she received from our friend Patrice. Cupcakes? What cupcakes? Apparently our friends who went to Austin, TX, affectionately referred to as “The Kids at South By” by Christina, had sent cupcakes to the bar that afternoon, unbeknownst to us. 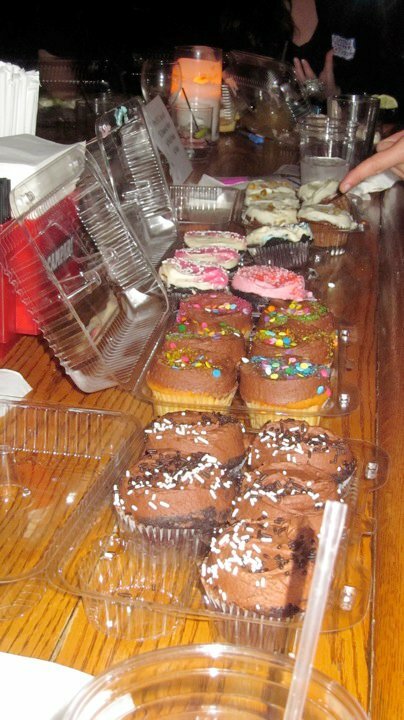 When Christina inquired about it with the bar staff, we were informed that cupcakes had been delivered to the bar that afternoon for our party and were sitting in a fridge downstairs, waiting for us. I thought they’d send a nominal number of cupcakes to the friends they knew would be there, but when I turned from talking to a friend, the bar was covered from end to end with containers of cupcakes. A veritable cornucopia of cupcakes of different colors and flavors. A very generous gift from our compatriots who journeyed south. So to Patrice and the other Kids At South By, a very special thank you from all of us who partook of your delicious donation to our event. The spongy cake and sweet icing were much appreciated by Christina, myself and all the other attendees of NxNYC who partook of the deliciousness. So What Does Your Startup Do?